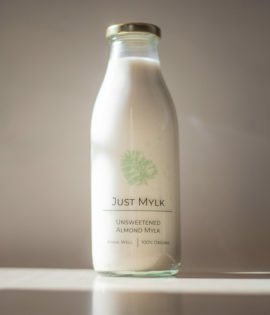 JUST MYLK is a small batch artisan nut mylk producer. We wanted to create a better alternative to the current vegan milks available. We wanted to make it sustainable, nourishing and accessible. On average, the conventional 1 L nut milk contains less than 3% nuts in each bottle. It is filled with emulsifiers, stabilizers, added vitamins, acidity regulators and more additional fillers. JUST MYLK uses 25% nuts in each bottle and has nothing to hide! No yucky add-ins. All our mylks are non-pasteurized, organic, and contain high nutrient ingredients, the way it’s meant to be!